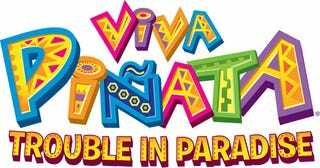 The leaked screens we saw yesterday were indeed for the new Viva Piñata: Trouble in Paradise. Rare's cooking up the sweets-laden Xbox 360 title for a September 2008 release. The sequel adds feature full co-op both online and locally, more customizations for the garden, and thirty new piñatas. Viva Pinata 2 Screens, And By Association, Announcement? Another interesting item? A "Piñata Vision" feature that lets players use Xbox Live's vision camera and printed cards to put extra content into the game. In Trouble in Paradise, evil Professor Pester and his ruffians have deleted Piñata Central's computer records, threatening piñata parties and tasking the player with rebuilding everything by sending piñatas around the world. This is the part where I refuse to admit that I watch the TV show religiously and know exactly what this means. Oops. Fact sheet after the jump. "Viva Piñata: Trouble in Paradise" Fact Sheet May 2008 Title: "Viva Piñata: Trouble in Paradise"
Overview: The original Rare Ltd. team behind "Viva Piñata" has reunited to bring gamers "Viva Piñata: Trouble in Paradise," the newest piñata adventure that invites gamers to return to magical Piñata Island. Unfortunately, not all is well on the island, as Professor Pester along with his gang of Ruffians have wiped out Piñata Central's computer records, which poses a threat to parties everywhere. To help Piñata Central, players must gradually rebuild the computer database by sending piñatas at full candiosity to parties all around the world. While thwarting Professor Pester's evil plot, players still build and maintain piñata gardens — using their creativity and imagination to attract, trap, protect, train and manage more than 100 different piñata species. Available exclusively on Xbox 360, "Viva Piñata: Trouble in Paradise" reinvigorates a colorful and engaging gaming experience on the Xbox 360 platform. Now with full cooperative and online gameplay modes, the "Viva Piñata" franchise opens its doors even wider with a new game that provides hours of fun for gamers of all ages, fans of the animated series and animal lovers alike. • Social. The world of Piñata Island is an inviting and rewarding place to be. Family members and friend now can share in the joy of creating a garden by simply plugging in an extra controller. The second player has access to all tools, actions and activities, but he or she also can collect magic by helping. Player two can spend magic by tinkering items, healing a sick piñata or filling a piñata candiosity meter. It's a new way to play. • Customizable. "Viva Piñata: Trouble in Paradise" allows players' imaginations to run wild by providing them with expansive freedom and choice. o Your garden. "Viva Piñata: Trouble in Paradise" also offers a vast level of customization within your main garden. Now, along with planting grass, trees and flowers, and digging ponds and lakes, players can place sand and snow in their garden to make exotic species of piñata feel more at home. Players also can choose to enhance their garden with themed object packs — make your garden into a space center, a pirate cove or a haunted graveyard. Buy objects to change the weather, or new toys for your piñata to play with. You have total freedom to create any kind of paradise you want! o Your piñatas. Thirty-two new species of piñata can run, crawl, fly and swim into your garden in "Viva Piñata: Trouble in Paradise." Large, small, fierce and cute, the new piñatas will join all your favorites for thriving activity throughout your garden. Among these new species are sour piñatas that will infiltrate and wreak havoc in the garden. In "Viva Piñata: Trouble in Paradise," players can choose to either tame sours, or feed them candy to keep them sweet. • Accessible. "Viva Piñata: Trouble in Paradise" reinvigorates the franchise with additional game modes and features that make it even more accessible to players of all ages and skill levels. o Just for Fun Mode. Designed for beginner players, kids and those just looking to explore Piñata Island, this mode allows players to jump into the garden and interact with the unique piñata world. In this mode the difficulty has been turned down and the fun has been turned up. Sour piñatas stay away, resident piñatas remain healthy, weeds don't plague your garden and you have an infinite chocolate coin bank account, allowing you to turn your garden into a veritable utopia of colorful creatures. o Standard Mode. Presenting a challenge for experienced piñata gardeners and dedicated gamers, the Standard gameplay mode provides a more tricky option, where players must keep a watchful eye on their garden. Sour piñatas, feuding species, weeds, illness and limited money call for you to exercise problem solving and creativity to build and maintain an environment where piñatas can flourish and grow. o Player Guide System. Replacing the traditional tutorial, the optional Player Guide System directs players through a series of loose goals to help them master the fundamental aspects of "Viva Piñata: Trouble in Paradise." o Show Off. Using the new photo mode in "Viva Piñata: Trouble in Paradise," you can snap, print and upload pictures of your unique garden or customized piñatas showing them off to your friends. You also can photograph your piñata and turn it into a piñata card, share it with your friends so they scan it and put it into their own garden using the Xbox LIVE Vision camera. o Piñata and character interaction. All your residents are now capable of performing dazzling tricks, which you can teach them using the new trick stick tool. Watch as piñatas play together, perch on each other and interact in new ways to make them more appealing. • Spontaneous. "Viva Piñata: Trouble in Paradise" is a constantly changing world where anything can and does happen. Rivalries, injuries, illness and fights — if you turn your back, who knows what your piñatas will do? o It's happening outside. Pester knows where your garden is, and he's got a few nasty tricks up his sleeve to make piñata life difficult. Foil his plans by sending your piñata around the world to save parties everywhere. Also, you must deal with new, untamed sour piñatas with bad attitudes and more troublesome Ruffians who will try to spoil your creation. o It's happening inside. Pester will try to block piñatas from ever reaching your garden, but you can break the blockades and teach him who is in charge on Piñata Island. However, don't underestimate Pester — he's likely to make some personal appearances to attempt to put you in your place. Information: Founded in 1985 and based in the United Kingdom, Rare Ltd. is one of the world's leading video game developers and has masterminded some of the most popular video games in history, including multi-million-dollar sellers "GoldenEye", "Perfect Dark", "Banjo-Kazooie" and the "Donkey Kong Country" Series. From 2005 to 2006, Rare released "Perfect Dark Zero", "Kameo: Elements of Power" and "Viva Piñata" for Xbox 360. Rare continues to entertain the world with the release of "Banjo-Kazooie: Nuts & Bolts" and "Viva Piñata: Trouble in Paradise" later this year. For further information visit www.rare.co.uk."